There is just nothing like delicious BBQ, and there are so many ways to prepare it! Unlike many of you, I am NOT talented on the Grill…I tend to like to stay inside where there are no giant mosquitos, flies or other flying insects to deal with. This recipe is easy to prepare ahead of time and can be frozen or kept in the fridge for a couple of days so you don’t have to deal with it at the last minute. This is a variation of a recipe that my sister, Nila makes and hers is delicious as well! Once again, I like to prepare foods that I already have most of the ingredients for. 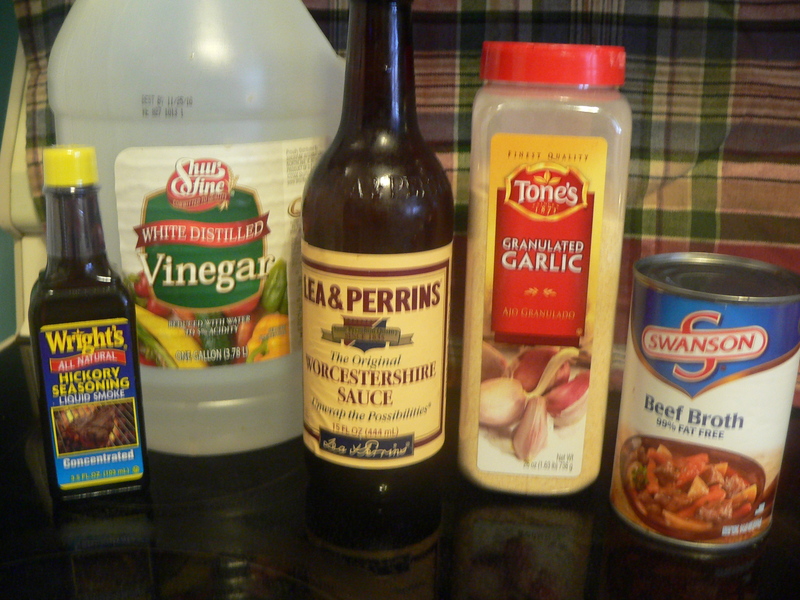 Here is the starting lineup…Liquid Smoke, Vinegar, Worscestershire Sauce, Garlic & Beef Broth. 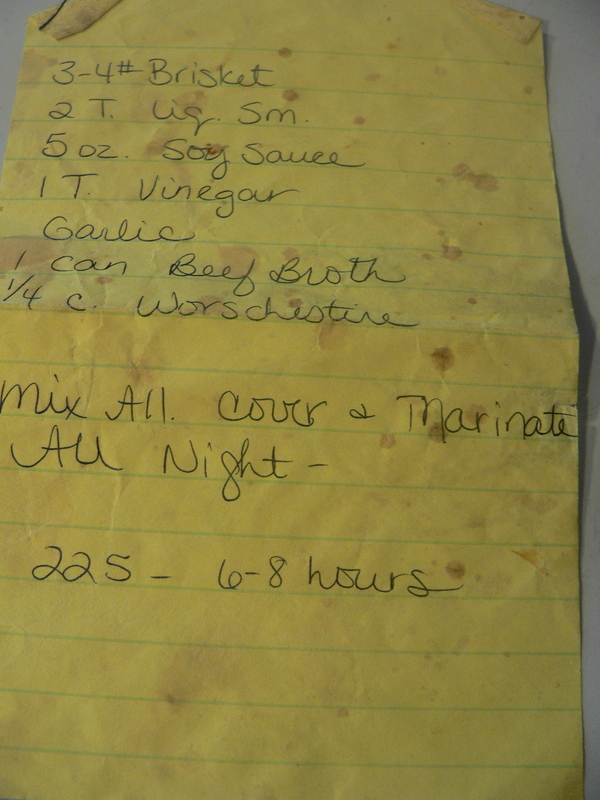 You know it’s a good one when your recipe looks like this! I have tweaked this one a bit so please, go off of the typed official recipe below. I have made this so many times, I couldn’t count it! We served this out at our pond one year for a fall get together and it was even better served outside. Mix up all of the marinade ingredients in a bowl. 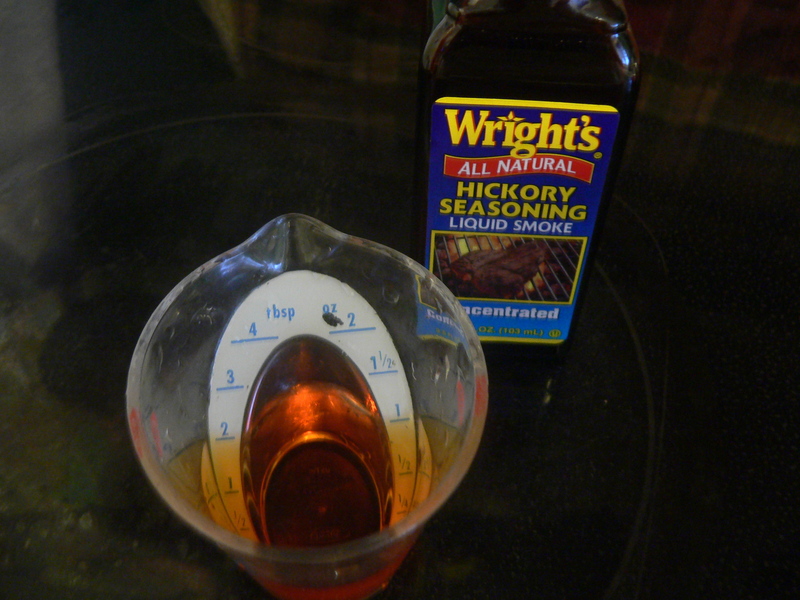 Liquid Smoke, Soy Sauce, Vinegar, Garlic, Worchestershire and beef broth. 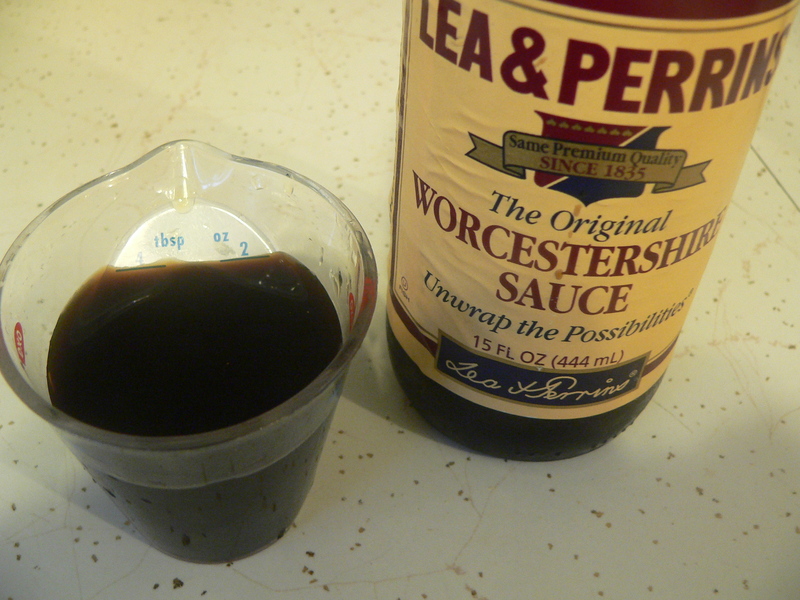 Lea & Perrins Worcestershire...Magic in a bottle! 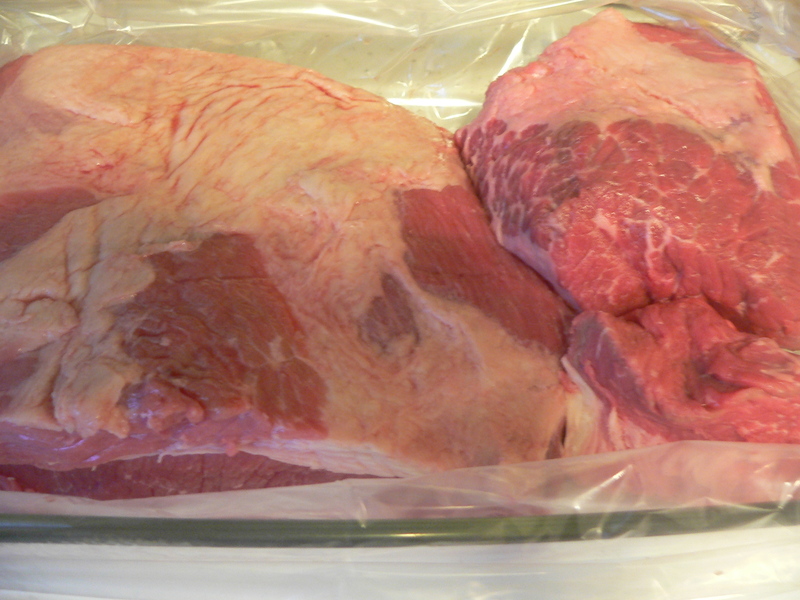 Place your trimmed Brisket into a large roasting pan that has been lined with an Oven Bag for easy clean up later. 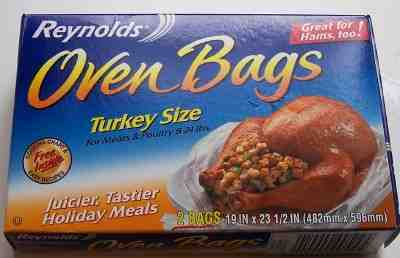 We use the Reynolds Turkey Size bags in this instance. Let this marinade all night. I usually put this together when I get home from work and let it sit in the fridge until early the next morning. Do not skip this step! This is only half of the brisket we cooked for this event! Pull out the brisket the next morning and pop it into the oven. Low & Slow is the name of the game for this recipe. Bake at 250 degrees…for as long as possible! I usually let it go for about 10-12 hours. 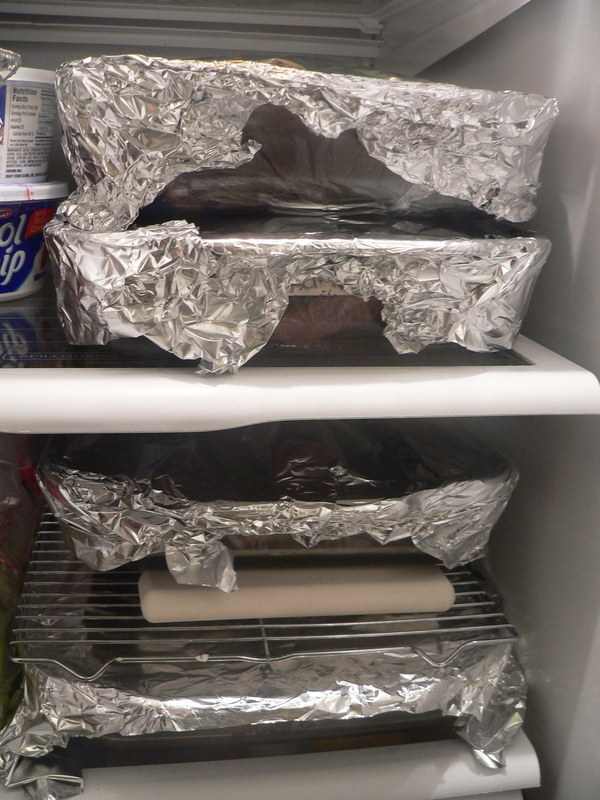 When the brisket is done, pull off the foil and open up the cooking bags so that the brisket can start to cool enough to handle it. Scoop out as much of the juice as you can and refrigerate so that all of the fat will come to the top and harden. (I leave this in overnight and remove the fat in the morning). Remove the fat from the brisket and discard. Slice or shred meat as desired. 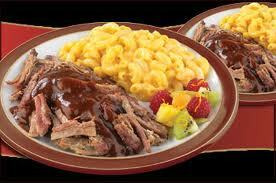 I put all of the meat into a gallon size freezer Zip Lock bag and store in the fridge or freezer until ready to serve. Pour in several cups of the beef juices to keep it nice and moist. About 3-4 hours before you’re ready to serve, place Slow Cooker liner in Crock Pot and place the beef and the juices into the Crock Pot. Heat on high until hot, then turn to low to keep warm for serving. You can serve this so many different ways! With BBQ sauce (we served it with our favorite Bronco Bob’s Raspberry Chipotle Sauce), with or without buns, rolled up in a burrito, on a philly steak style sandwich, more like a roast with potatoes & carrots, and on and on. Hope you enjoy this as much as our family has over the years! It is a great dish to make ahead and serve to a crowd, and can be easily frozen. Mix all ingredients except brisket. 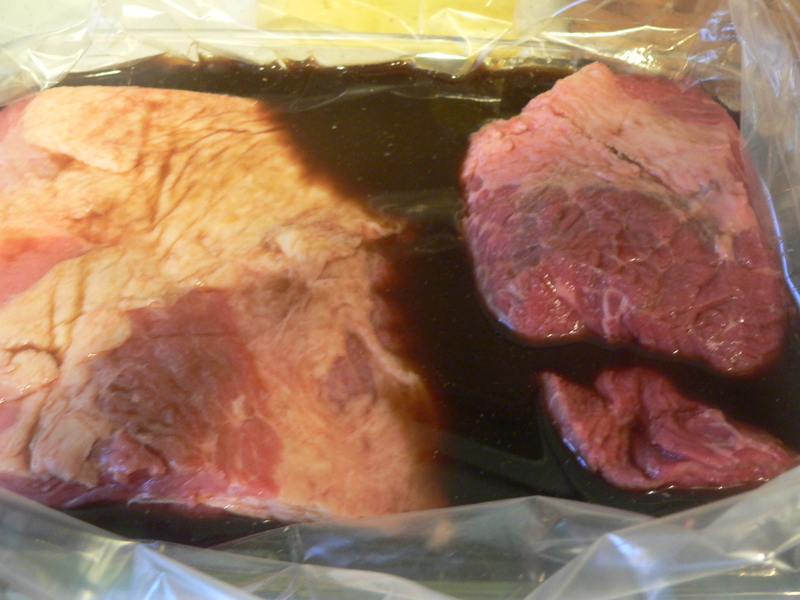 Place brisket in an oven cooking bag and pour in marinade. Use twist tie to close. Marinate in refrigerator overnight. Cut 3 small slits in top of cooking bag. Bake at 250 for 8-10 hours. Let cool some before removing any remaining fat. Slice or shred and place meat in a zip lock bag. Refrigerate meat juices until fat rises to the top and remove fat. Pour reserved juices over the meat and store in a zip lock bag until ready to serve. I make this ahead of time and refrigerate or freeze until serving day. 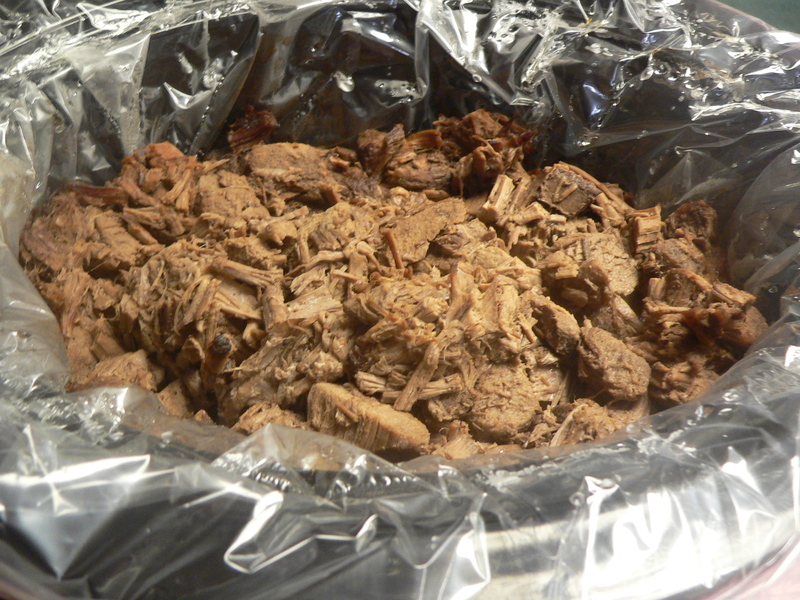 Put cooked meat and juices into a lined Crock Pot and reheat until ready to serve. Delicious! We have served this Beef Brisket several times for Events at Adrians, and just featured it in our recent Southern themed menu for our 2011 Spring Open House. It is a great choice for a make ahead recipe and can be easily frozen to serve later. Beef Brisket, Original Beer Bread Company Beer Bread, Marie Callendars Corn Bread, Brookville Cole Slaw & of course “Pig-Pickin’ Cake” for dessert.